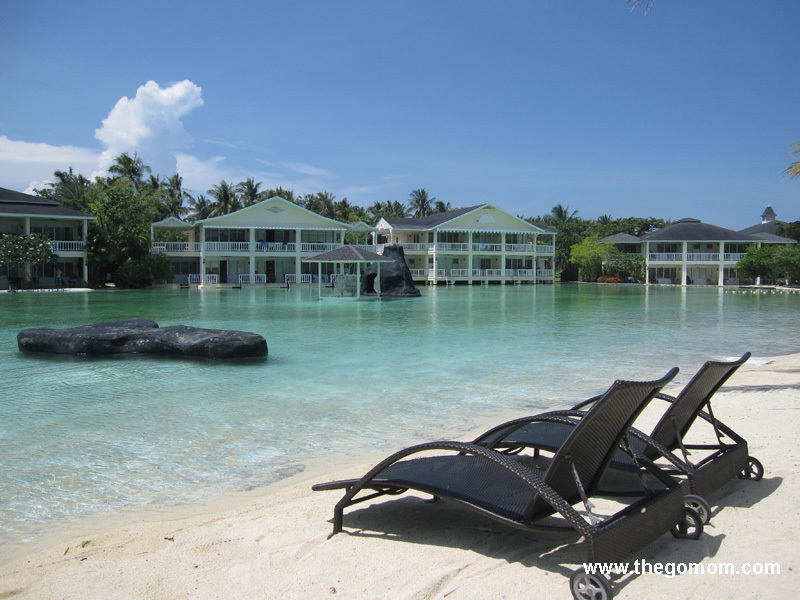 My kids have been aching to go to Plantation Bay since the time we took a sneak peak 2 years ago. They got their wish last Holy Week as we flew to Cebu and spent 2 nights and 3 days in Plantation. On our first day, my kids were a little bit disappointed because they swam at the freshwater pool at the Wind Ward Cluster. Beautiful as it looked, it had floating leaves and flowers on it. My kids are a little bit finicky when it comes to cleanliness and they don't want to see anything floating on the pool. The pool also wasn't tiled and that was a bit of a shocker for them (all pools and lagoons are not tiled except for the pool at the Piazza Palermo). Just for you guys to manage your expectations and especially your kids', the pools are not tiled. 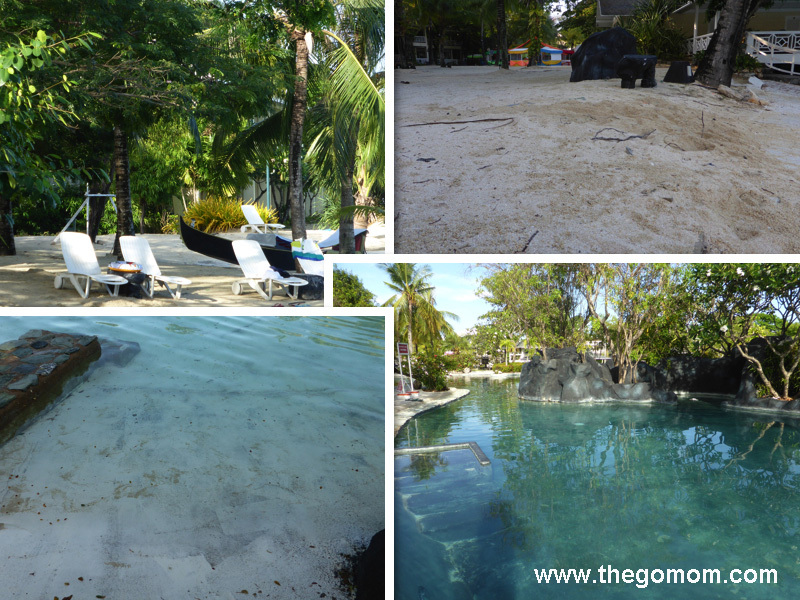 Also, because the resort is dotted with trees, the pool has occasional leaves/twigs on it and of course sand. The lagoon is man-made and so are those huge rock boulders. The slightly fine sand (its not fine powder), since it is also recreated does not go deep. My kids were a little bit upset to find a sheet of plastic (I think that is the sand liner) while they were digging to make sand castles. My kids are quite fussy but we found a lot of nice spots and we were g--o-o-d! The kids thoroughly enjoyed the freshwater swimming pool at the Kilimanjaro Cafe. It had shallow (maybe 3 feet) parts that merges with the 4 feet deep parts. My toddler loved that he could stand on the shallow parts while his siblings are just swimming happily nearby. In the middle of the pool stood a cave like structure that had a slide. And on the sides are small pockets of bubble benches anyone can enter in and out from. 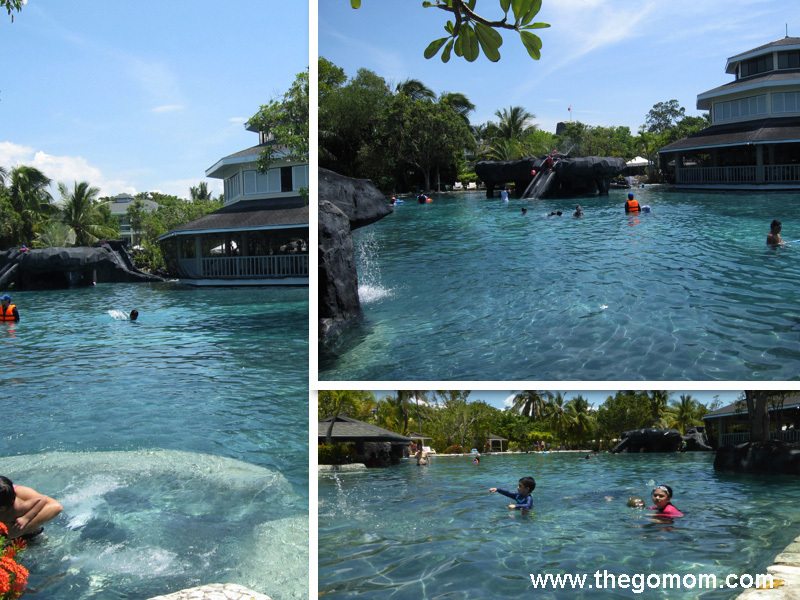 They also enjoyed swimming on the saltwater lagoon just across the beach area. The huge, man-made salt water lagoon (2.3 hectares of it!) is the heart of Plantation Bay. My tweeners jumped off the diving rock several times. You could also rent kayaks for use in one part of the lagoon (P250 for 30 mins). There is also a huge man-made cave the kids can slide on. Life vests are available to all guests. Their smallest vest fit my toddler (3 years old) perfectly. So no need to bring your life vest. 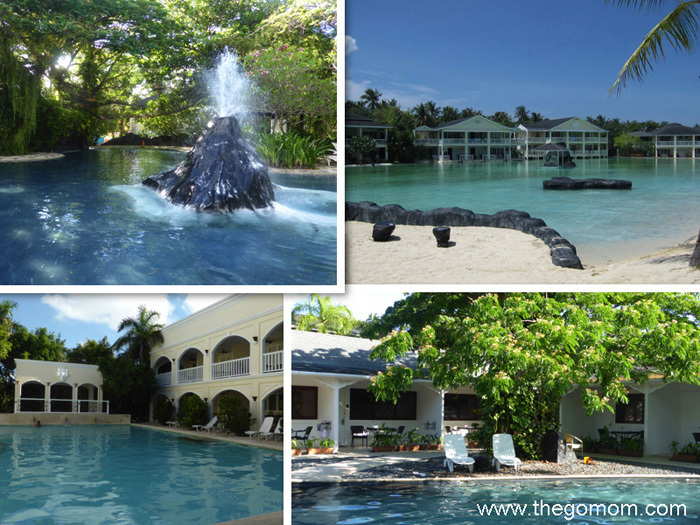 Click here to read Part 2 of Cebu Plantation Bay Review (review of beach, accommodations, service, other activities). Hi Mary Joy! Nag enjoy talaga kami sa Plantation. It’s beautiful and so many things to do with the family. Try it there:-) But try not to schedule on a Holy Week, double yung rates.